LIMA, Peru – Senior enlisted leaders from the West Virginia Army National Guard (WVARNG) spent five days assisting in the training and development of the Non-Commissioned Officer (NCO) corps for the Peruvian Army (PERAR) March 25 through 29, 2019 in Lima. Command Sgt. Maj. Phillip Cantrell, senior enlisted leader for the West Virginia National Guard (WVNG); Command Sgt. Maj. James “Dusty” Jones, state command sergeant major for the WVARNG; Sgt. Maj. Steven Williams, operations sergeant major for the WVARNG; and Command Sgt. Maj (ret.) Kevin Harry, former senior enlisted leader for the WVNG, presented numerous classes on NCO professional development during the week-long engagement as a part of the National Guard Bureau’s State Partnership Program (SPP). While the Peruvian military has a large NCO corps, it does not traditionally hold the leadership responsibilities and standards of training and education associated with NCOs in the United States military. 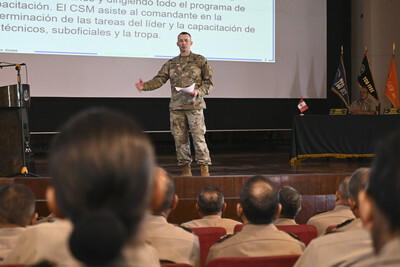 The team of sergeants major taught classes and provided mentorship focused on priorities established by the Peruvian army, U.S. Army Southern Command, and the WVNG through the SPP. Each day, members of the West Virginia delegation presented courses to the PERAR senior NCOs on the basics for the U.S. Army’s NCO development expectations for advancement. Each session allowed for a question and answer period for direct feedback between PERAR senior enlisted leaders and NCOs and U.S. forces. Topics included the roles and responsibilities of a senior NCO, toxic leadership, formal and informal communication skills, the officer and NCO relationship, unit administration and more. On March 26, the WVNG delegation joined the Peruvian Army as they celebrated the “Day of the PERAR NCO”. This marked a significant accomplishment for the Peruvian Army’s NCO corps, as it was the first time in their history that the NCO corps was recognized independently for their contributions to Peru’s defense. The commanding general of the Peruvian Army, General de Ejército Jorge Orlando Celiz, joined PERER NCOs for the celebration and also highlighted the importance of the West Virginia – Peru partnership during a speech to PERAR’s NCO academy soldiers. In addition to the celebration for the Day of the PERAR NCO, the team of Soldiers from the WVNG joined more than 150 PERAR NCOs for a physical training session March 26. The 5k run enabled the WVNG team to build camaraderie and esprit de corps with the PERAR NCOs and showcase the importance of leading from the front and being engaged with soldiers at all levels. At the conclusion of the week, PERAR’s Sergeant Major of the Army presented information on the structure and history of the Peruvian Army’s NCO corps to the West Virginia team and discussed opportunities for the transformation of their army. Future engagements with the Peruvian military, and specifically the PERAR, will continue to build upon a foundation for institutional change to education and leader development within the PERAR NCO corps.